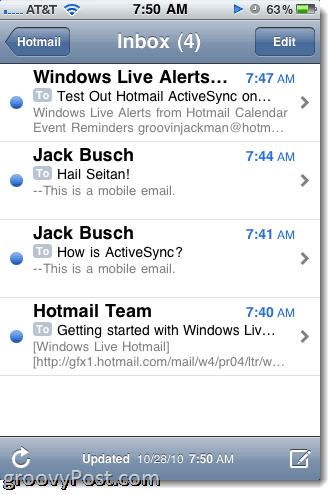 In a blog post in August, the Windows Live Team announced that Hotmail now supports push notifications for Emails, Contacts and Calendars. That’s great news for iPhone users who want to get their email and appointment notifications as soon as they arrive in their inbox or calendar. 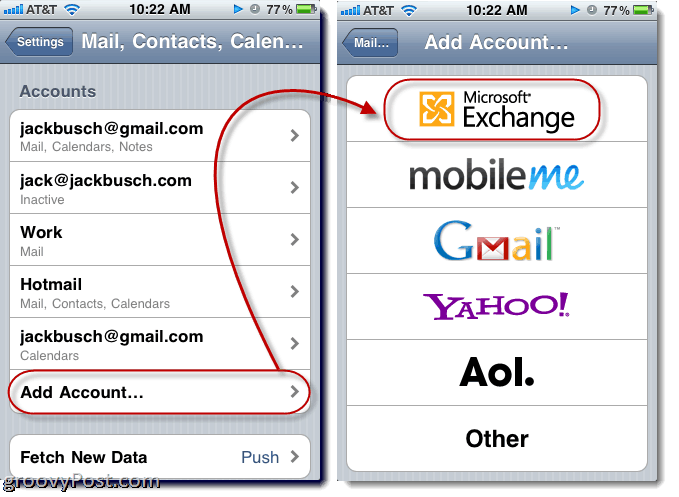 Using Exchange ActiveSync (EAS), you can set your iPhone up to add Hotmail to your Mail app and automatically add contacts and events to your calendar. This works in a similar fashion to Google’s Syncing for Gmail and Google Calendars. 1. From your Home screen, touch Settings. 8. Enter your password in the Password field. This is what you’d type in if you were logging in at http://mail.live.com. 9. Enter a suitable Description. By default, this will say “Exchange” which is a bit vague. I recommend typing in Hotmail or something else more meaningful. 10. Touch Next. 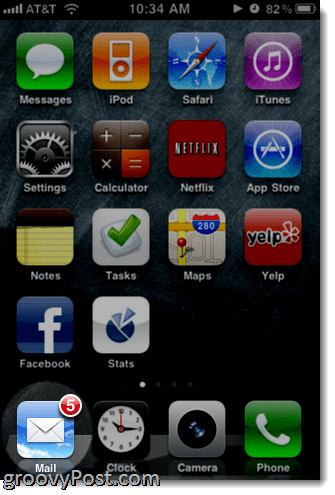 iOS 4 will do a little verification and pop up with a new field labeled Server. 11. Type m.hotmail.com into the Server field. Touch Next. Now, you should see little badges next to your mail whenever you have new mail in your Hotmail account. 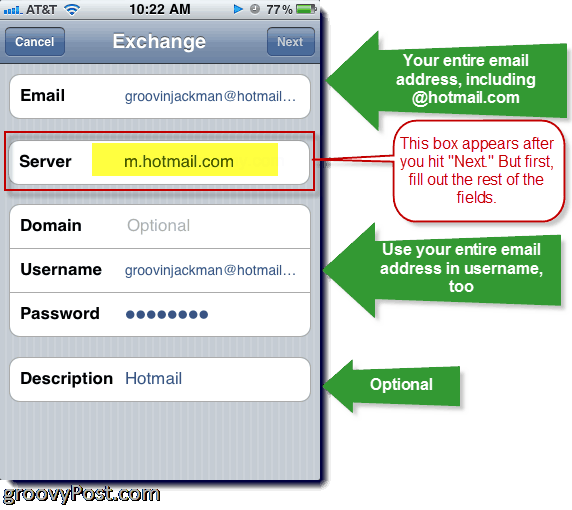 If you have multiple email accounts setup on your iPhone, you can choose your Hotmail inbox or view all of your inboxes, including your Hotmail account. If you want to send an email using the Hotmail server, simply touch the From field when you’re composing an email and choose your Hotmail address. By default, the iPhone will try to set the From field to the same address that received the email. By default, EAS will only sync the last 3 days of mail from your inbox. You can change this by going back into Settings and Mail, Contacts, Calendars and tapping the Hotmail account you just created on your iPhone. Near the bottom, you’ll see an option for Mail Days to Sync which you can alter as you see fit. Same goes for Mail Folders to Push. The ability to choose which Mail Folders to Push is handy say, if you only want to push emails that have been routed to an Urgent folder that you set up in Windows Live Hotmail. That way, your iPhone won’t buzz every time you get a Beef Jerky Store Newsletter, Facebook notification or some other non-essential email. 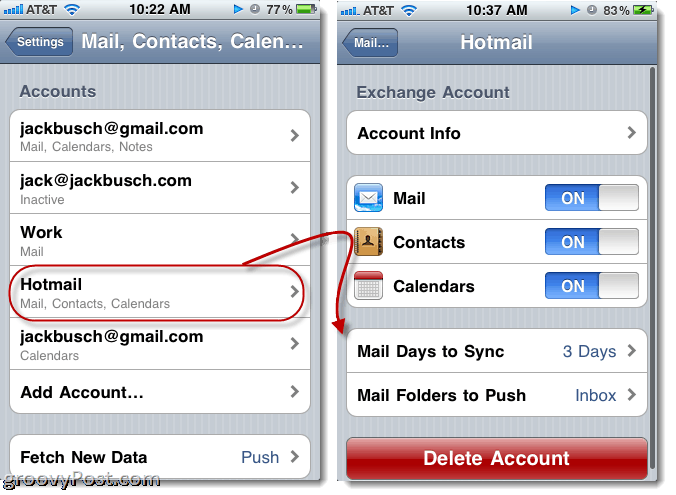 In the Mail Settings screen, you can also choose whether or not you’d like to sync your Calendars and Contacts. Note that if you choose to sync your contacts, iOS 4 will ask if you want to throw out all of your existing iPhone contacts. This is so you don’t end up with duplicate contacts. I don’t recommend this, just because I’m paranoid that I’ll lose a contact that wasn’t already in my Windows Live Mail contacts. Syncing of your Hotmail Calendars is a lot less nerve-wracking. Instead of overwriting events, it simply lays them on top of your other Calendars. If you want to show or hide specific calendars, simply touch Calendars in the top left hand corner. Likewise, when you add events from your iPhone, you can choose which calendar to sync it with by touching the Calendar field in the Add Event dialog. 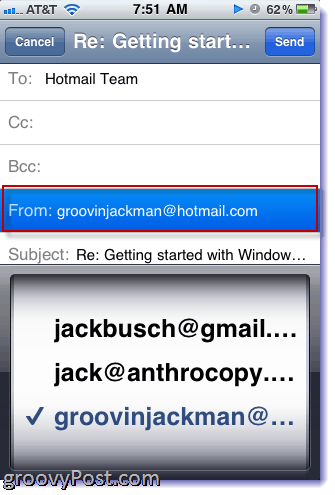 That’s practically everything you need to know about getting Hotmail and your iPhone to play nice together. Enjoy! I’m now huge fan of Hotmail! 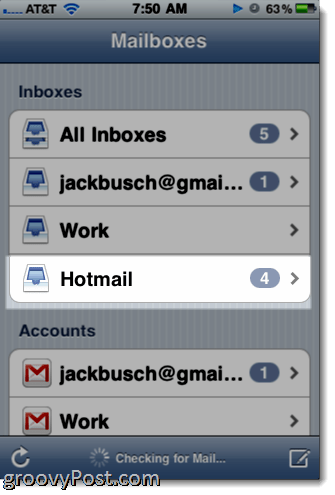 It integrates extremely well with outlook and now with the iphone. Plus, for small business users like me, you can do this all with your own domain. It is an excellent service. Nice job MSFT. Hi followed all your instructions to set up my hotmail to sync with my iphone and just after I complete the step to verfiy my hotmail accounter after I added “m.hotmail.com” in the server section, i get the Exchange Account message “unable to verify account infirmation”! Have you come accross this before? I am not sure why it cannot vefiry my account as I have had this email account for agesm it works fine on the intenet and I used correct password and email address. Are you able to help with this? You probably already tried this, but just in case: make sure that your password is typed in correctly. I got the same error, and re-typing my password fixed it. Good luck! Its almost been 3 weeks searching on how to sync my Hotmail to my Iphone 4 just to see all my emails in my hotmail. Thank you I found your tutorial its really work! just follow your instruction then thats it! Fantastic! your great! Thank you so much for this tutorial! This worked perfectly! 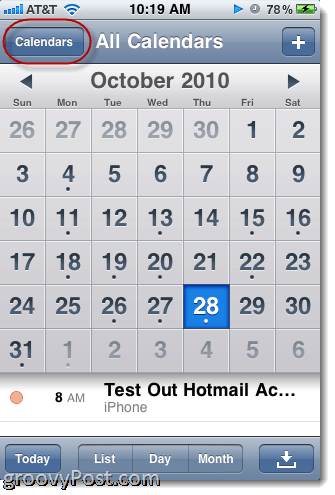 When I first bought my iPhone (Aug 2010), I couldn’t figure out how to sync my hotmail calendar with my iPhone, and thought it couldn’t be done. It’s been frustrating not having my calendar with me all the time, so I thought I would search again for instructions. Thank you! New contacts I add to my phone do not seem to get added to hotmail contacts. All mail and calendar seems to go through. Contacts is on. I am still having the same problem as LadyBB; I have tried to add account under hotmail and Exchange and both my ipad and iphone cannot verify my email information. I use my hotmail everyday on the computer so i know my information is correct when i type it in. Any ideas? I was able to intall Hotmail and my Hotmail calendar. The issue I have is if I create a calendar item for my hotmail calendar on originating from my iPhone it syncs to my hotmail calendar fine. 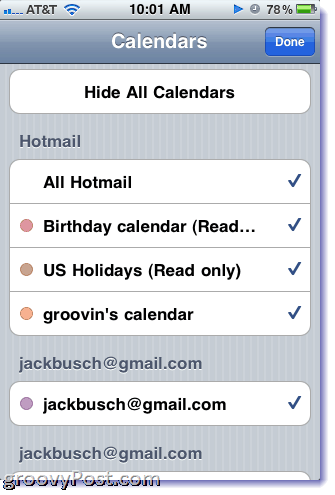 However, if I create the event directly in my Hotmail calendar on the web, it does not sync to my iPhone. So FRUSTRATING! Any ideas? I tried turning on the sharing feature for my hotmail calendar but that didn’t work either.